The area, however, has a long history commencing with the arrival of the pioneering Duffield family during the early 1860s. John Duffield, Snr. (ca. 1823-1881) purchased Portion 31, Parish of Redcliffe, on 19 November 1862 and leased two surrounding Portions (33 and 51). An 1863 report on agricultural reserves noted that Portion 31 contained a hut and a garden. After his death, the Portion 31 property, then known as ‘Woodlands’, was willed to his wife, Martha Duffield (ca. 1825-1905), and his son, John Duffield, Jnr. John Duffield, Jnr. 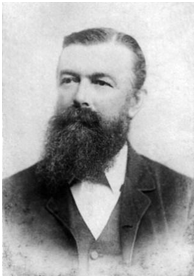 (1844-1930), was born in Halifax, Yorkshire. At the age of 18, he accompanied his parents to Australia and settled on the North Pine River, later purchasing the Portion 33 land which his father had leased. He was reputedly the first man to drive a horse team to the Gympie goldfield where he worked for some time operating a store as an agent for J. & J. Burns. 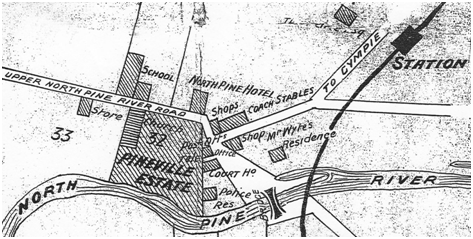 After his marriage in 1869 to Selina Everton, he returned to North Pine where he continued farming and, in 1885, he opened a general store located on his Portion 33 land on the southern side of the Upper North Pine Road, opposite the North Pine State School and very close to the Gordon Jackson Lookout of today. His daughter, Esther Catherine Martha Duffield (1870-1930), worked at the store and was the postmistress from 1888 until 1899 when the Post Office was moved from the store to the North Pine Railway Station. After the store was destroyed by fire in 1901, and as a consequence of the severity of the ‘Federation drought’, the family moved to Palmwoods. Portion of a real estate map dating from the mid 1880s.